Building of openWrt for PC. It is very useful to build openWrt for X86 by analysing of openWrt or by device developing based on openWrt. It makes the debug process much more quicker and understanding how it works comes faster. Let's learn doing this because it is fairly simply. OpenWrt is evolving constantly and those step instructions that work today can be not working in some time. Probably it happens to the previous how-to that you can find on this web site. Nevertheless «make menuconfig» remains changeless :)). Therefore let's run it and apply the following configuration. I think there are many ways to install OpenWrt on PC, therefore the version from this site doesn't pretend to anything, it is just a variant of installing that seemed interesting to me. 1) For installing of OpenWrt for x86 one should create a partitition on the hard disk drive for ex. by Acronis Partition Magic or by some other utility. 3) Let's copy the file system of openwrt from the directory /openwrtX86/bin/x86. Let's also create the directory /boot there and copy the kernel image «openwrt-x86-generic-vmlinuz» in this directory from here /openwrtX86/bin/x86/. The installation is over, it is left to add an entry to the boot menu grub. 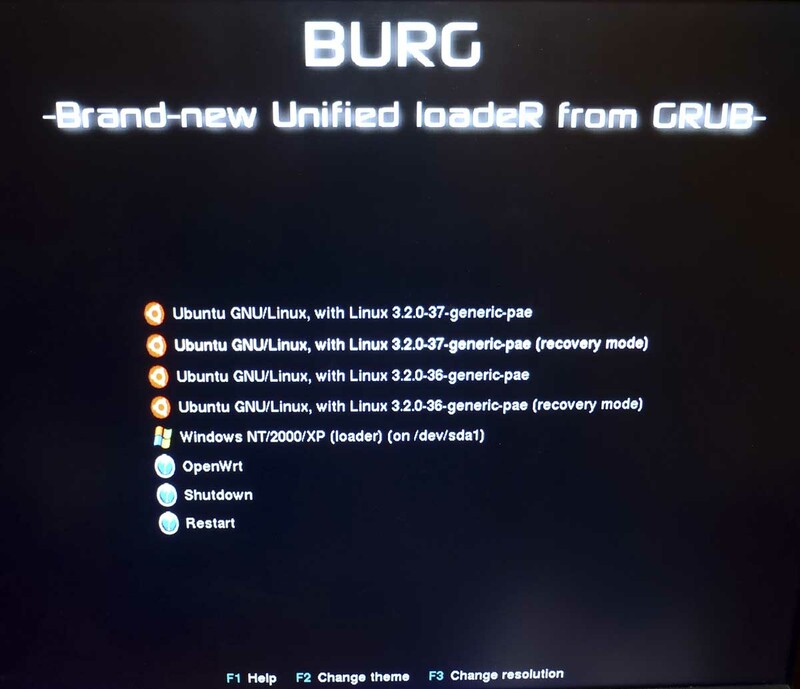 Because I use burg, so burg is to be added to the boot menu. 2) to delete the entries «linux-image-» of the nonusable versions by using of synaptic. PC can be rebooted now. It is very useful to add a package with gcc by configuring of openWrt. Then we can get a fully-featured machine for programming. The building and installation method of openWrt for PC, described above, can be useful by debugging of some hardware drivers or software. In general it is not complicated, but it is much more simply and faster to run openWrt on a virtual machine like «VMware Player» or «VM VirtualBox».